The elegant WEMPE PIRATE II Series addresses passionate sailors, yacht owners, and friends of marine lifestyle. 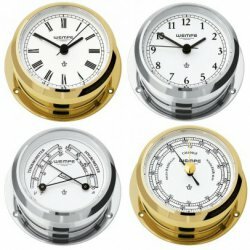 The nautical precision instruments of the traditional German company are not only a highlight on board - their great looks decorate even offices or living rooms with their high quality housing, chrome plated or highly polished brass. The PIRATE II Series with a diameter of 95mm consists of a classy yacht clock with battery-powered quartz movement, a barometer to measure atmospheric pressure, and a convenient comfortmeter. It combines thermometer and hygrometer in one gadget and helps establishing a healthy and comfortable climate in the living area. All housings of WEMPE PIRATE II instruments can be opened with the hidden spherical head to switch batteries etc. The clock face is white and 61mm in diameter and is therefore easily read.